Set of two Mark 10 20mm Oerlikon guns with Mk.14 gyro gunsight. 3D printed parts. 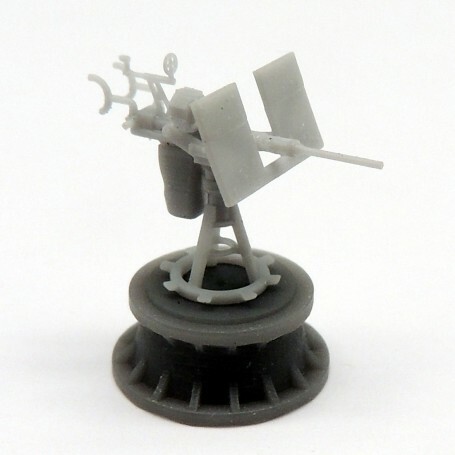 Contains 2x 3D printed 20mm Oerlikon Mark10 with Mk.14 gyro gunsight guns. Each gun consists of seven individual parts. Pedestal, shield, gun itself, mount, cartridge collecting bag, ammunition drum and gunsight. Modeler can select elevation of gun. Standard gun shield with rectangular opening adapted to house the Mk.14 relay box.